Toronto is flooded with condo developments, many of which feature lavish units that cost a pretty penny to acquire, but it's not so common to have a building where the least expensive units are well over a million bucks. This is, however, the case at this new Rosedale development called Hill and Dale. 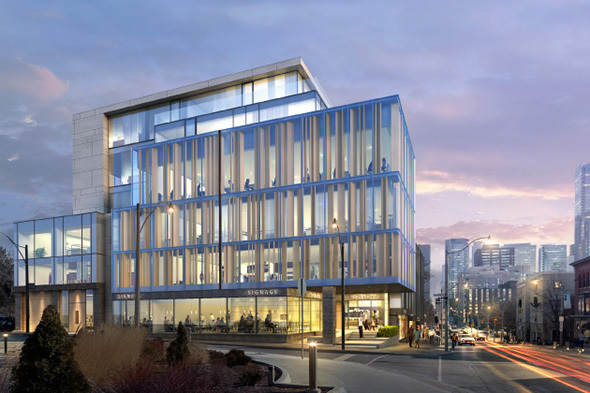 This sleek-looking building is actually more than a condo, with plans in place for two floors of retail, office space, and luxury residences at the top. It's sure to inject some extra life into this particular stretch of Yonge St., which could use a dash of vibrancy on the west side of the street. 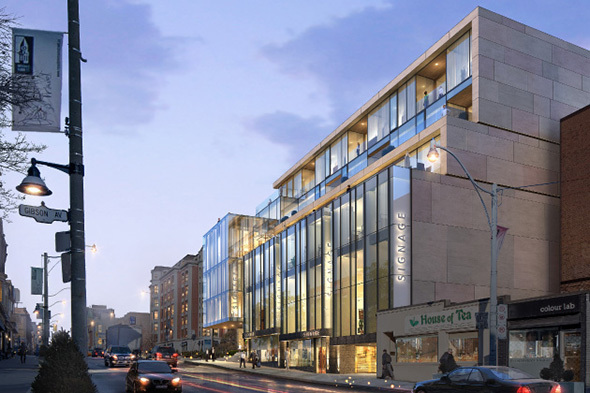 For years the site at 1 Roxborough has been home to the bland brick offices of SkyLink, but developer Old Stonehenge envisions a mixed use building in its place that will attract high end retail and empty nesters from nearby Summerhill and Rosedale (get the name now?) homes. Normally, a smaller scale project like this wouldn't be that exciting. At six-storeys and with just 17 units, it's certainly scaled to the neighbourhood, but the shiny glass architecture makes this an exciting prospect for a portion of Yonge St. that lacks any buildings that one would describe as remarkable (the exception being the LCBO in the converted North Toronto Railway Station). Units range in size from 871 square feet up to 3,600 square feet, which means that the $1 million plus starting price tag doesn't even capture how expensive - and presumably luxurious - the largest units will be. From sweeping terraces to oversized kitchens, these will not be typical condos.